I-87 to exit 21 at Catskill to Rte 23 west to Rte 145 north, then Rte 20 west. Exit Rte 20 at the Cherry Valley-Rte 166 South exit. Travel about 2 miles to the traffic light in Cherry Valley, turn left continuing on Rte 166 South. 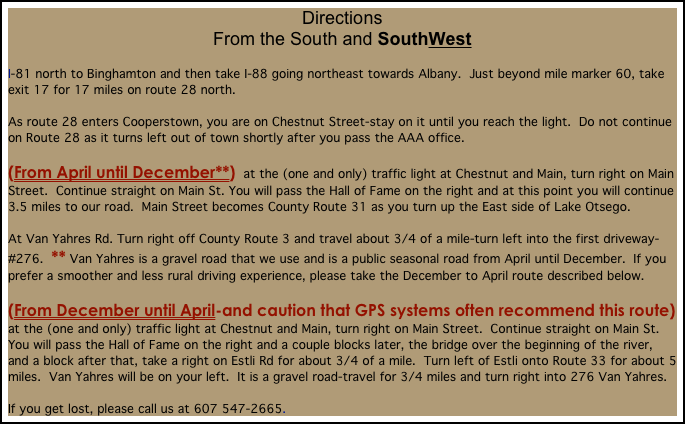 After turning at the light, proceed for about 2.5-3 miles, watch for a sign and turn right to Cooperstown and County Rte 33. This is very easy to miss! On Rte 33, proceed for about 6 miles. Just before turning on Van Yahres, you will have made a gradual incline and will see a red barn on the left . Across from the barn, you will see a sign for Van Yahres on the right. Go up Van Yahres about 3/4 of a mile and turn into the last driveway on the right-#276. 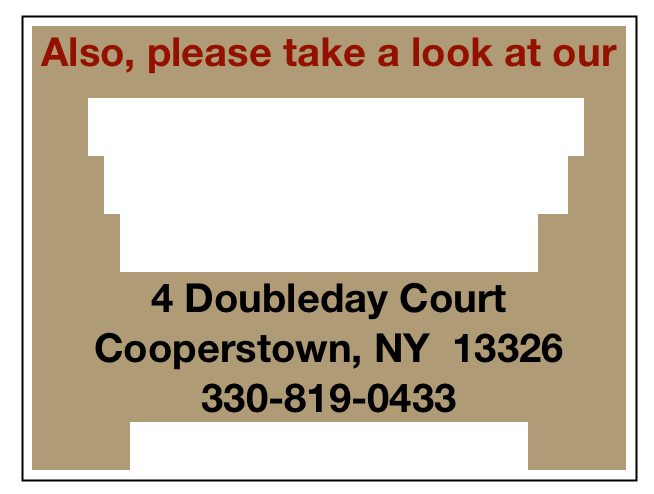 If you get lost, please call us at 607 547-2665. Thruway I-90 West from Albany to I-88 South. After about 6 miles, exit I-88 onto Route 20 at Duanesburg and proceed on Route 20 West towards Cherry Valley for about 35 miles. Proceed on Rt 20 to Rt 31 for about 8 miles until you arrive at Van Yahres-requires a hard left turn. traffic light in Cherry Valley. Turn left at the light and continue on Rt. 166 South for 2.4 miles, watch for a sign for Cooperstown and turn right on to County Road #33. This turn is very easy to miss!. On Rte. #33 travel about 6.9 miles. You will see a red barn on left and Van Yahres Rd. on Right. (This is a gravel road). We are last house on Right 276 Van Yahres. The B&B is located at 276 Van Yahres Road which is situated East/West between County Highway 31 and County Highway 33. The entrance from #31 is 3 miles to town and is a seasonal, gravel road, that can get a little bumpy from spring thaw but is what we use during the months of April - November. 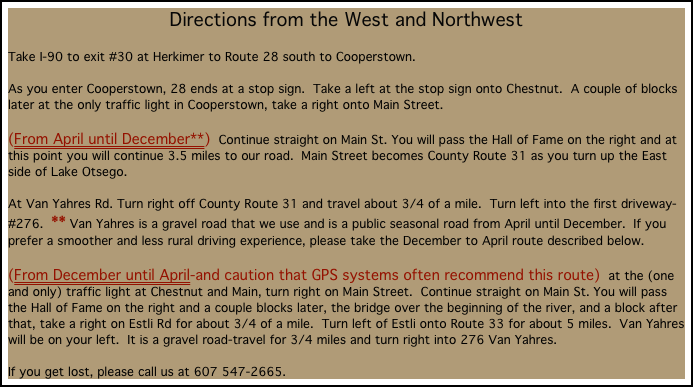 For those that are not as adventurous, please use the entrance from the east on County Highway 33. It is approximately 3 miles longer to get to town but offers a paved option for most of the drive.